BEAUTIFULLY DECORATED FOR THE HOLIDAY SEASON!! We call this Cabin, 'Oak Ridge'. This LUXURY LOG CABIN on a half acre lot is located 2.5 miles from the Parkway in Pigeon Forge in a peaceful forested area off Wears Valley Road. The cabin is PRIVATE yet convenient to area attractions. Perfect for rest and relaxation, or to come and go to all day long with paved roads and no mountains to climb. This is the perfect cabin for a couple honeymooning, celebrating an anniversary, or visiting the Smokies. You will feel right at home with the warmth of this REAL LOG CABIN. The LARGE SPA BATHROOM has a TWO PERSON JACUZZI with MOOD LIGHTING and separate stand up shower. Enjoy a game of POOL IN THE LOFT AREA, or relax in the HOT TUB WITH YOUR FAVORITE BEVERAGE. Enjoy the craftsmanship of an over-sized STONE FIREPLACE, log walls, vaulted ceilings, and hand-made wooden doors and latches. TWO TV's; one in the bedroom, and one in the Great Room with is in HD. A FULLY PREPARED KITCHEN makes snacks and meals a breeze, along with a GAS GRILL on the deck. TWO COVERED PORCHES, ONE WITH THE GRILL AND SWING, AND THE OTHER WITH ROCKERS AND HOT-TUB. FREE WIFI. TWO COVERED PORCHES, ONE WITH THE GRILL AND SWING, AND THE OTHER WITH ROCKERS AND HOT-TUB. We personally make sure each guest arrives to a cabin that has been cleaned and prepared for immaculately. We live locally, and take great pride in providing superb accommodations to our guests. We sincerely hope that you will want to return time and again. We also have 2 other 1 bedroom log cabins which sleep 2 adults only, and within 2 miles of the Parkway. They are Homeaway Listing 365745 and 365162, or on the VRBO and Vacation Rentals sites as Listing 365745ha and 365162ha. Looking to add a little 'WOW' factor? Surprise you partner with requesting: A dozen red roses placed in the cabin with your sentiments on the card followed by a trail of rose petals leading to the spa room with rose petals scattered around the 2 person jacuzzi and a bottle of sparkling beverage and two wine glasses on the side. The placard will have your special occasion and your names on it. All for a total of $58 plus tax. For celebrations such as Birthday, we'll have a chocolate cake set with candles under a glass dome waiting on the kitchen counter as you walk in. Alongside, will be birthday plates, a banner, and a customized card. All for a total of $15 plus tax. We are Lisa and Michael Wood, and we decided to move to this area back in 1991 after enjoying visiting here. We both originally came from the aircraft industry, but had the opportunity to do something we dreamed of, live the mountain lifestyle. If you've visited the area before, you will understand the attraction to this area. If you are visiting for the first time, we guarantee you will come often. We decided on this property because of the location, just 2 1/2 miles (or 2 streets away) from the Parkway and Wears Valley Rd. in the middle of Pigeon Forge. All the roads are paved and wide leading to the cabin, and the driveway is paved also. We also liked the fact that the cabin sits up and off the street with the woods on all sides of a 1/2 acre lot. We feel the unique benefits of staying at our cabin is that it is a real log cabin that is well maintained and super clean. It is super cozy and tastefully decorated. Centrally located to all the restaurants, shopping and music theaters one direction and the Smoky Mountain Nat'l Park the other. 2 person jetted tub in large spa bathroom with recessed mood lighting above. 2 miles to Pigeon Forge Pkwy. No mountains to climb. All roads paved and wide. Wooded setting. Great room with oversize gas fireplace. 12 cup size - we supply the coffee filters. Cable HDTV with 'On Demand' free movies. TV in Great Room, and TV in bedroom. Full covered porch on front and rear of cabin. Pigeon Forge Fitness Center located 2 miles away with indoor and outdoor pools, indoor tracks, weight room, racquetball, basketball, ping pong, and bowling. We had a great stay! We were Very impressed with the cleanliness of the cabin. The area was a quiet and peaceful, but convenient to the places we wanted to go. The owners are super nice and easy to work with. We had everything we needed to have a perfect weekend! Thank you again!! Not a single complaint. Me and my now fiancé (he proposed at the cabin<3) miss it so much, we’re already planning a trip back. Everything was clean, well stocked, in working order. It was peaceful and refreshing at the cabin, but only a short drive to the hustle of the tourist attractions. A few cabins near by, but private enough to enjoy the patio hot tub. Playing pool in the loft was our nightly unwind time after spending the day in town. All around a great time. Easy to drive to cabin just off parkway, cabin is beautiful exceptionally clean, enjoyed our stay! Cabin is very inviting, the personal touches left by the hosts were wonderful. We plan on returning in the future 😊. Very clean well kept. Easy in and out. Place was easy to get to, quiet, super clean, and not far from pigeon forge attractions. Loved the pool table upstairs, fireplace, jetted tub, and Jacuzzi. Would highly recommend. Forested area, 2 miles from the Parkway (Hwy. 441) and Wears Valley Road (Hwy. 321) which is the center of Pigeon Forge attractions. Off Wears Valley Road and in 1/2 a mile. Paved roads all the way. Our cabins are for 2 adults only, no children, pets or visitors. No trailers allowed. 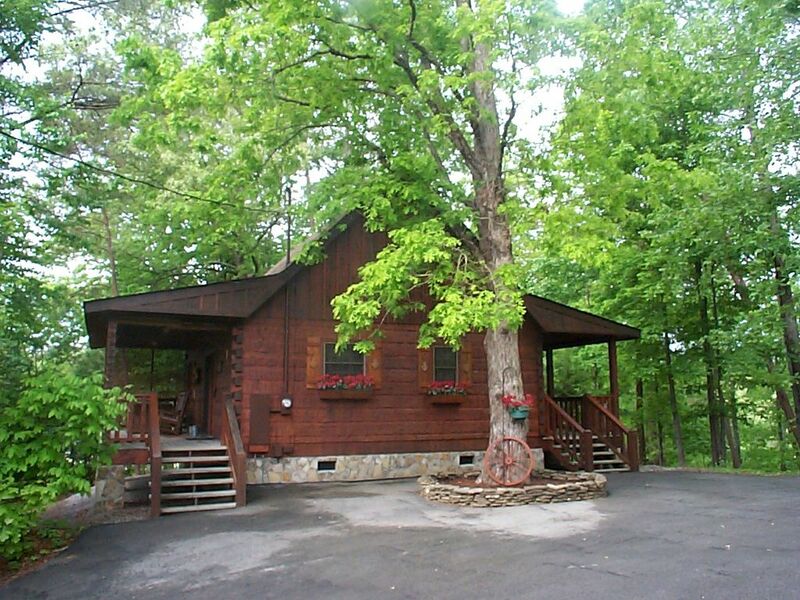 We also have 2 other 1 bedroom log cabins which sleep 2 adults only, and within 2 miles of the Parkway. They are Homeaway Listing 365745 and 365162, or on the VRBO and Vacation Rentals sites as Listing 365745ha and 365162ha.